There is an epidemic of babies around here at the moment. Actually, forget that, it makes it sound like a bad thing, let’s call it a multitude of happy events instead. Now some of these babies have been around for several months, and some of them haven’t even arrived yet, but the one thing I can guarantee they all have in common, is that they couldn’t give two hoots about knitwear. Nevertheless, in my knit-addled mind, it is of course imperative to swaddle them in woolly goodness as quickly as possible. Any failure to do so is a catastrophe of my own making and the knitting gods will punish me accordingly. I realise this is moderately insane, since the babies are oblivious, and the parents, although happy to receive knitwear, are by no means expecting it, so there really is no pressure. Even though I recognise this, I have still been operating a baby-knitwear factory for the last couple of weeks. I was looking forward to a catch up with two dear friends who both had baby girls last year, and although I have given them both baby blankets, and one has had a tank top as well, I wanted them to have a proper jumper. A little extra bit of woolly love to keep them cosy. For some reason I decided to do this about a week before seeing them, so there was some intense knitting to be done. Luckily, babies are small, so it really didn’t take too long to end up with these. 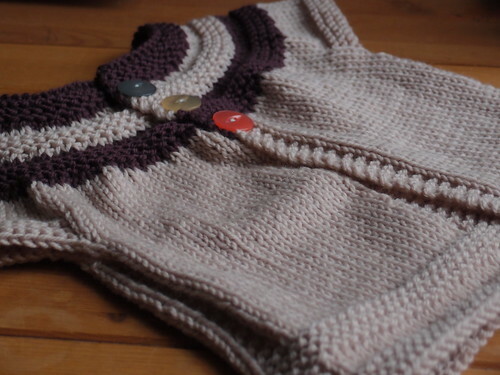 This is the In Threes cardigan, a brilliantly quick knit for little girls. 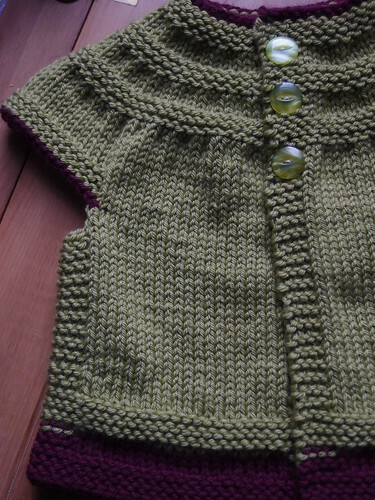 The sizing is generous and the swing shape and short sleeves mean that people seem to get a lot of wear out of the design – a nice bonus, given that most baby knitwear seems to fit the recipient for about a week and half. I was using stash yarn, so I combined two colours of Rico Merino Aran. As you can see, I didn’t have any matching buttons, but I quite like the mish-mash of colours. Babe number 2 is older, and received the Little Coffee Bean Cardigan. I knit the 12 month size, which came up about right for an 8 month old to have some growing room, although I think I could have made the body a little longer. It was supposed to have long sleeves, but I worried I was going to run out of yarn. This one’s quite hard to photograph as it’s actually a dark navy blue, but you get the idea. These two are so adorable and were really very tolerant of the pesky knitwear (and the knitter, who managed to bag some cuddles). Another In Threes Cardigan in a pretty shade of green (that’s a bit more vibrant than in the photo). But the knitting factory can’t stop yet – there’s one baby arriving any moment, another coming in a week, and two more due in March! But I think it’s well worth it if it means we can nab them while they’re young, and get in there early with some woolly goodness. Ah, yes, it’s the same here across the pond. I need to jump on making my best knitting friend the Little Coffee Bean cardi. I should make some more too and stash them away for either my own child or just to have for emergencies. I love how Juno is trying to comfort her friend! SO CUTE!! 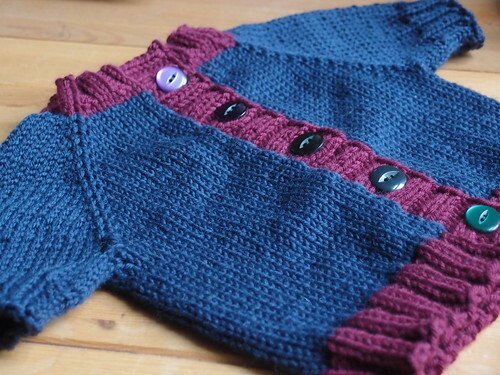 I love that In Threes Cardigan…can’t wait till I have a lil girl to knit for, so far it’s all boys around here. Love those cardigans and the pictures. What a good friend you are!